Thanks to Carbon, a big box UT will be the prize to the winner! Thanks to award winning horror soundtrack producer Sam Haynes, a code for this years (not yet released) 17 track Halloween album "Pumpkin on your Stereo"
-Theme of the contest is CHAOS ...spooky bloody chaos! Inspiration, textures and decoration can be taken out of the ChaosUT mod. -No weapon placement from this mod... we want this maps playable for everyone. Even for people without Chaos-UT installed. -The playable area must be inside a 4096x4096x4096uu space. 1 bonus-point if you can get even the sky-zone inside that space. - You can use any pack (u/utx/umx/uax) you want, but must include any exotic one into your submission. Filesize should be reasonable, so for a +1 point, the sum of all files used inside a zip file should not be bigger than 10 MB. The Chaos files doesn't count, because we will put them into the final map-pack anyway. Only exotic files which are not included in Chaos or vanilla-Install have to be put into the zip or MyLevel. Those files and the map are the one counting. -The contest badge must be placed somewhere into the map on a visible place. Not just in some easter-egg room. masked 256x256 pcx version by Terraniux masked 1024x1024 pcx version by nogardilaref. - Map Screenshot, Bot-Support and Music (at least a MyLeveled blank.umx) are a must. From September 1st to October 13th (UTC-0 time). The maps will have a public voting poll to ascertain the Gamers Choice. But also a separate vote of all the participants to determine the winner of the contest. The mappers can vote for others but not for his own map. This will be explained in details later in the Vote threads. That's it. Let the mapping begin! Last edited by papercoffee on Wed Oct 24, 2018 9:43 pm, edited 34 times in total. Actually full bot support and online playability are requirements rather than recommendations. Gonna fix it soon, thanks. Also would be nice if you would spread around other forums like beyondunreal or epic's forums. It's 03:15 here and I'm going to bed. I'll spread the word, but quick recommend. UnrealGGecko wrote: -Theme of the contest is CHAOS ...spooky bloody chaos! Inspiration, textures and decoration can be taken out of the ChaosUT mod. Okay, ignore me, I'm doing another mapping things out of contest... out of Chaos. Good luck to all participants and best regards! Chaos stuff can be MyLevel'd to avoid the dependency, and isn't there much of it iirc, but mapping Chaos packages are "mapping packages" nonetheless, not the actual mod itself. So the objective here is for the map to be playable with any mod (including standard weapons), but be Chaos themed, even if that means a dependency towards the packages meant for mapping only, which per the contest rules must be present with the map itself in the zip, to avoid anyone to have to install the mod itself. nogardilaref wrote: So the objective here is for the map to be playable with any mod (including standard weapons), but be Chaos themed, even if that means a dependency towards the packages meant for mapping only, which per the contest rules must be present with the map itself in the zip, to avoid anyone to have to install the mod itself. 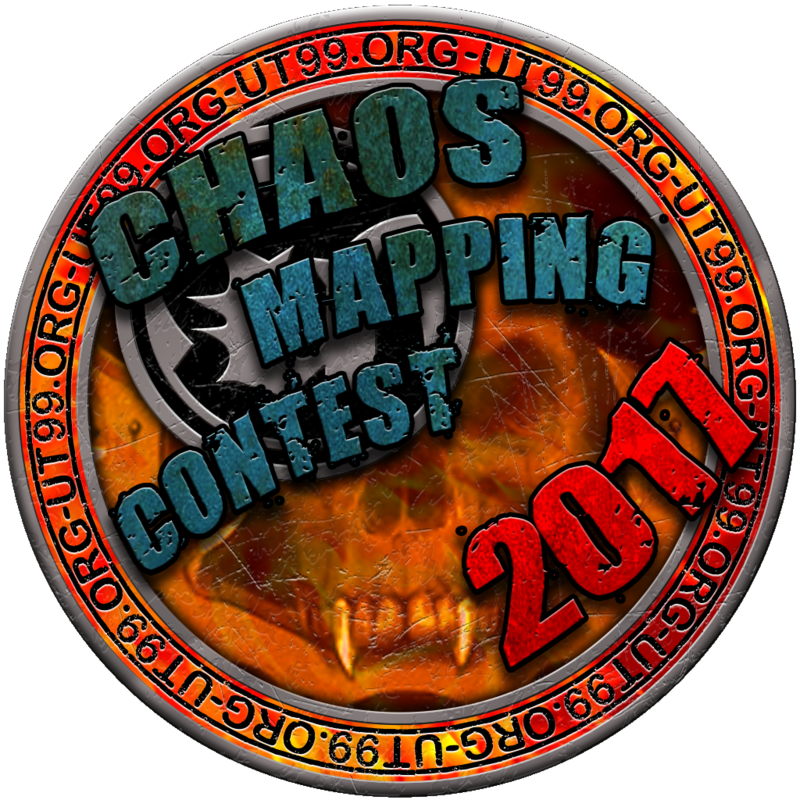 Presumably then, since the contest is Chaos themed, any Chaos mapping packages used should not count towards the 10MB soft total file size limit (if so, this is not made clear in the contest rules). If they want to keep within the 10MB limit, some people are likely to be deterred from using some Chaos mapping packages because of their size - for example, ChaosMapSounds.uax is around 5MB, add in Chaos_Decor.u at about 1MB and a custom texture or music file at 3/4/5 MB and the limit is reached before taking account of the map itself. Read the discussion thread... The Chaos files doesn't count, because we will put them into the final map-pack anyway. Only exotic files which are not included in Chaos or vanilla-Install have to be put into the zip or MyLevel. Those files and the map are the one counting. Are you done now? START MAPPING! TIME IS RUNNING!! papercoffee wrote: Read the discussion thread... The Chaos files doesn't count, because we will put them into the final map-pack anyway. Only exotic files which are not included in Chaos or vanilla-Install have to be put into the zip or MyLevel. Those files and the map are the one counting. I have indeed followed the discussion thread very closely. If the Chaos files don't count, then this needs to be clearly stated in the rules (if only for the sake of clarity, but surely it is the rules that people should follow rather than what has been said during the discussion?) - at the moment the rules clearly state "the sum of all files used inside a zip file should not be bigger than 10 MB" (emphasis added). Mappers will need to include the Chaos files from which they take resources in their zip submissions otherwise, prior to the distribution of the final map pack, gamers without Chaos will not be able to view or play them (or the maps will look incomplete as logos, etc won't be displayed). Hence gamers without Chaos would not be able to vote on the submitted maps. papercoffee wrote: The Chaos files doesn't count, because we will put them into the final map-pack anyway. Only exotic files which are not included in Chaos or vanilla-Install have to be put into the zip or MyLevel. Those files and the map are the one counting. Or else those bloody nitpickers won't start mapping. I already started, when I finished my map, then I'll check if my map fits most of the rules ; so far so good. Try to worry lezz humanz and be more at MyPurr in thez editor - as my cat is saying. Is MiB (2^20) or MB (10^6) meant here? It makes a difference of 48576 Bytes. Barbie wrote: Is MiB (2^20) or MB (10^6) meant here? It makes a difference of 48576 Bytes. I guess we will only know if those participating pronounce themselves, with perhaps the map name they're going to build. As for me, I am participating (started the map yesterday) and it's going to be called CTF-CMC-Kullrena. I am probably also going to do a slight DM variation, since the map should play well for both gametypes, but I am not sure if it would be something I would submit for the contest. After I started doing it, it became abundantly clear that I have overestimated the 4096uu limit for what I intended to do, but I voted for it so now I have to own it. I had planned something slightly bigger, but I am able to adapt it quite well anyway within this limit, and I am having quite some fun doing it. One thing though: is there a list of which weapons does each Chaos weapon replace? To have a reference.